Think you’ve had macarons? Pah. You have NOT. And I say this with confidence. Oodles of it. For I (Poppy) have had macarons from Giselle Richardson and LET ME TELL YOU, Poppy Lovers, there is no going back. Lady Richardson began her mission to make the BestestMacaronsInTheWorld because she discovered that most of the top-notch macarons were being shipped over from Paris. Oui. So although they may taste good (bon) and often delicious (délicieux) they are not ever going to be as super duper fresh as those from WRB. (That’s Wharf Road Bakery). Nor will they be made purely from seasonal ingredients straight from our lush British soil.. e.g. beetroot, pumpkin and apple in Winter… and strawberry, cherry and plum in Summer. Ho hum. WRB is leaping from strength to strength, so if Giselle isn’t manning her exceptionally popular weekly stall (there are queues) at Cabbages and Frocks Market in Marylebone, or delivering new scrummy stock to Spitalfields’ A.Gold or The De Beauvoir Deli Co in Islington, then she’s boxing up her macarons for lucky people’s parties, weddings and events. And at £1.50 a go, (or less if you order more than 10) there’s no reason in the world why we can’t all treat ourselves. Or our friends. Or ourselves, again. So, I say it again. 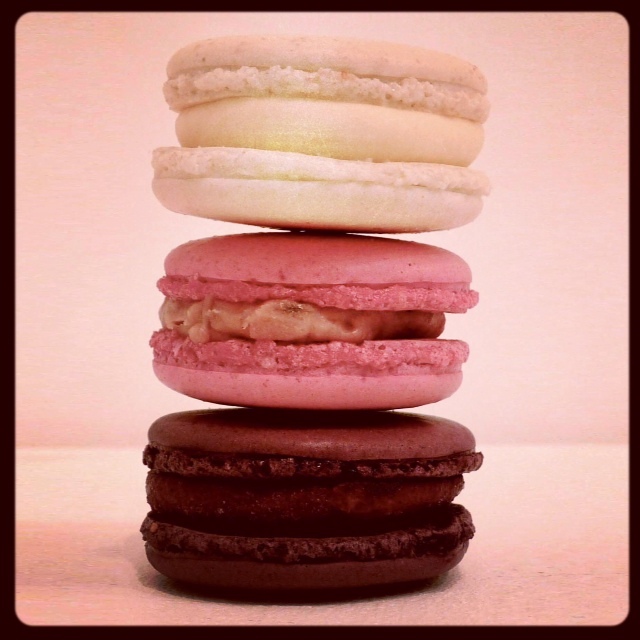 Think you’ve had macarons? Pah. You have NOT. Giselle Richardson macarons are currently available every Saturday at Cabbages and Frocks Market, Marylebone, 11am – 5pm. 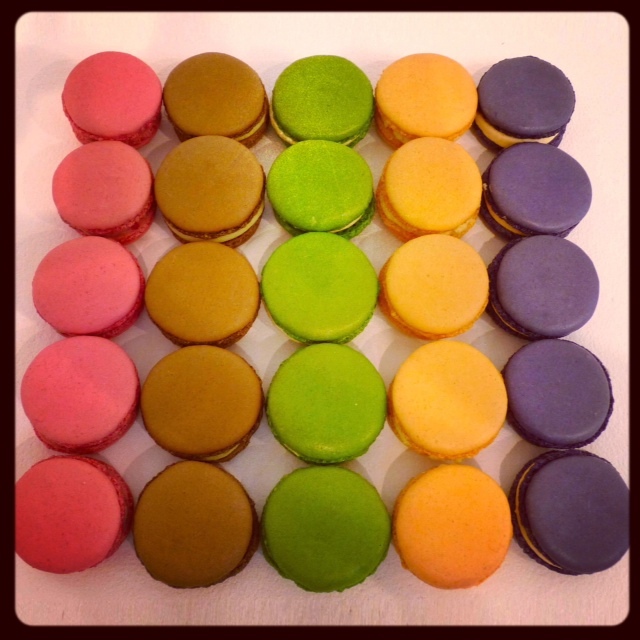 WIN a box of 20 macarons from Wharf Road Bakery! Competition ends Friday 22nd February. Good luck! Entrants not meeting the above requirements will be deemed invalid and therefore not included in the draw. Signing up to my mailing list is compulsory and all the other steps are optional and are additional chances to win, however they will be deemed invalid if the entrant has not completed the compulsory step of signing up to my mailing list. Entrants are to leave a separate comment below for each step they complete. The competition will run from 9am on the 14th February 2013, through to midnight 22nd February 2013. I will contact the winner within a week of the competition ending. If the winner doesn’t respond or accept the prize within 2 weeks of notification I reserve the right to draw a new winner. Commenting! These look absolutely delicious, so delicate and love all the rainbow colours! think i am follower no 26 on bloglovin. AND – I’ve never tasted a macaroon – I’ve clearly not lived. Ooo Joy, you have it all to come…! Hi! I’m on mailing list, follow on Facebook, and shared on FB also!!! Oh Em Gee! J’aime les macaroons! We were recently in Brussels and had some amazing macarons from Pierre Marcolini. Like go back to Brussels good. I always mean to try to make my own but I must admit I’m a bit intimidated by the whole process! And followed on Blog Lovin’. Can you tell I really NEED these macarons??? I love how much filling they have in them as well. Drool! Would be MORE than happy to test some of these LOL!!! Done all the above steps. Already signed up to mailing list. Left comment on Blog post. Following you and Wharf Road Bakery on Twitter. Signed up to and following on Blog Lovin’. They looked gorgeous ! Have signed up and tweeted ! done, done done & want, want want!!! I follow both on twitter and tweeted as @PaigeBrown5. These sound really nice and would be a great idea for my sister’s wedding in a few months. I feel like I must be the only person to to have tried macarons so I have quite an established idea of what they will be like. I am particularly tempted by the idea of a lavender macaron! So happy I found this blog. It looks like my kinda hangout. So pleased you found me! Welcome to my little corner ;-) See you here again soon..
Hiya! I’ve followed, shared and liked on facebook (Aurora Joy) and followed you both and retweeted on twitter (laineybeans there!) 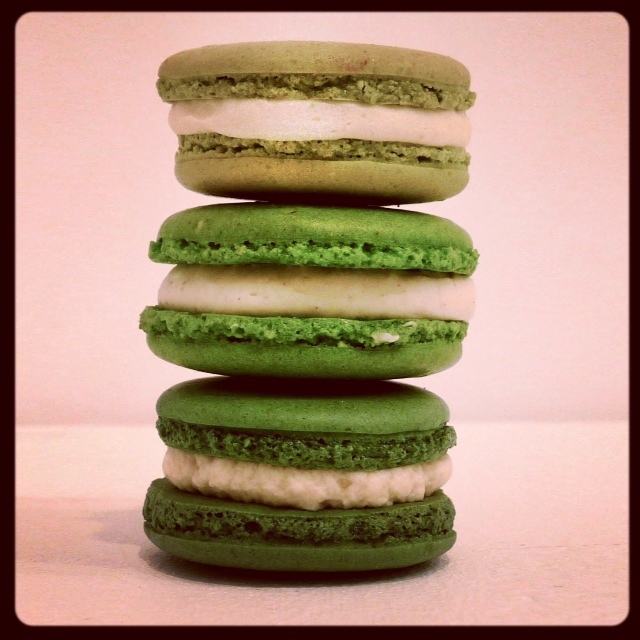 – I would really love to try a macaroon some day, why not start with a *good* one?